Metal roofing finishes in complex colors and patterns bring beauty and protection to your home. We know that how it looks matters, and we’re excited about two new color offerings in our premium metal roofing finishes. 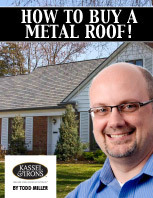 KasselWood introduces our exclusive Steelscape colors for metal shingles. These multi-hued colors offer greater color variation than ever before. Cinder Gray has a variety of black and gray tones for a slate look. These colors feature top-of-the-line PVDF chemistry for maximum fade and chalk resistance. They are created through a unique proprietary process that applies several colors to the quality base steel. Though these special finishes would work well as a replacement for cedar or slate on a home with rustic or old-world character, consider using them on roofs with long expanses for nice effects in sunlight or in shadow. The subtle color variations will add interest to a house that receives a good deal of sunlight, or, will help a rooftop blend in and complement a shady location. You can try-out this design idea with our metal roofing visualizer tool. An outstanding, lifetime product warranty. Designed and manufactured to meet rigorous quality standards. Made with recycled materials with the finished product becoming 100% recyclable. Fire resistant, wind resistant, impact resistant…and fade resistant. The beauty of wood shakes with the strength of steel. Steelscape is a proven industry leader in innovative metal coatings, and Kassel & Irons is very pleased to have partnered with them for this significant advancement in residential metal roofing. Take a look at these beautiful home protectors!